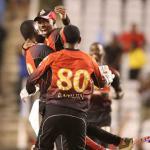 The biggest party in sport came back to the Brian Lara Academy in Tarouba on Friday and the Trinis were in their glee. Chris Gayle’s STKNP were bidding to become the St Kitts and Nevis Party Poopers, thus confirming recent whispers by a little voice to the effect that, for the Trinbago Knight Riders, this is the year for loss. Most of the locals present pooh-poohed the STKNPP idea, insisting that TKR were far from finished. But not every Trini in Tarouba was prepared to stand behind the home side. Photo: Don’t look behind you! A SKNP fielder tries to stay focused while TKNR supporters roar on their team during 2018 CPL Eliminator action at the Brian Lara Academy in Tarouba on 14 September 2018. Erstwhile Guyana Amazon Warriors skipper Rayad Emrit showed himself a pragmatist, declaring that he was backing the STKNP because he didn’t want to find himself out in the middle on Sunday evening with everybody screaming and shouting in support of the other side. “I’m backing cricket,” St Lucia Stars’ captain Kieron Pollard pusillanimously told the TV interviewer—showing himself to be no less of a spoilsport than he was a year ago, when he denied fellow Trini Evin Lewis, on strike on 97, a possible T20 century by bowling a no-ball to end the match. 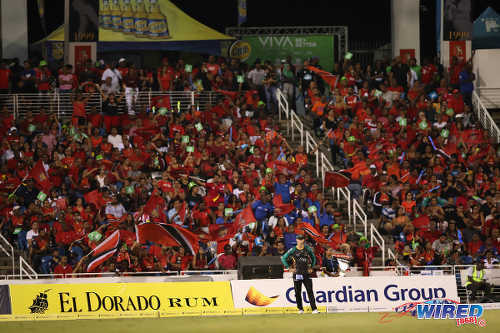 Red and ready Prime Minister Keith Rowley, who was spotted holding court among the Tarouba faithful, would have—I’m pretty certain—declared the allrounder unpatriotic. 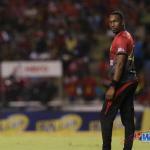 STKNP’s Lewis on the other hand left little doubt that he was a true Trini, intemperately holing out to Colin Munro at midwicket with just over eight overs left. That made the score 75 for 4 and left his team still 91 runs shy of its 166 target. 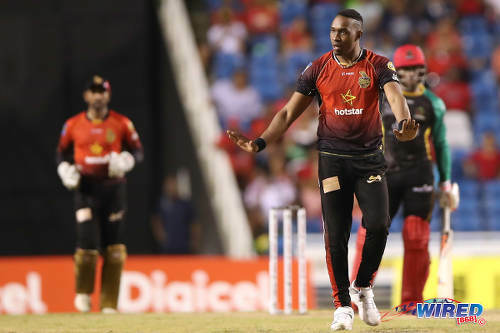 And TKR’s inspirational captain Dwayne Bravo showed himself to be as stubborn as a mule—again saving himself for the latter part of the STKNP innings and conceding 40-plus runs from his four overs, including his 30th six of the current season. 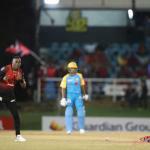 Photo: TKR captain Dwayne Bravo (centre) gestures to his teammates during 2018 CPL Eliminator action against SKNP at the Brian Lara Academy in Tarouba on 14 September 2018. But we Trinis love a winner so, because TKR rained on STKNP’s putative parade, DJB is unlikely to hear too much about where he went wrong. Unless, of course, he contrives to lead his team to defeat in today’s final against Chris Green’s GAW. Misreading the nature of the Tarouba track, Bravo opted for right-arm pacer Anderson Phillip ahead of left-arm finger-spinner Khary Pierre, who has been outstanding in the three games he has so far played. 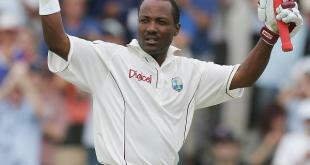 Phillip went for 17 in the six balls he bowled in his two overs, his first and last. Then arguably aware of persistent criticism for his use of his spinners—and his supposedly costly non-use of Colin Ingram leg-spin—in the qualifier against GAW, Bravo called up the newcomer for over number seven. If Devon Thomas, who had smashed four fours off Phillip’s over, had succeeded in his effort to deposit Ingram’s sixth ball in the Petrotrin refinery, Bravo would have had some explaining to do. In the event, Thomas lost his leg-stump and the inspired skipper’s face was wreathed in smiles. Bravo must also have been smiling when his opposite number, realising the sluggish nature of the track, came on to bowl over number seven. Gayle had not bowled his full quota of four overs in a CPL match since 2014; he did on Friday. 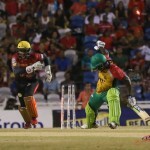 And they cost his team 32 runs and the TKR opposition the prize wicket of Brendon McCullum, arguably a fair exchange. 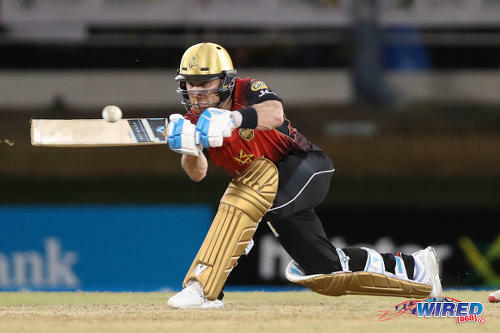 Photo: TKR batsman Brendon McCullum on the attack during CPL action against the Jamaica Tallawahs at the Queen’s Park Oval on 10 August 2018. Tabraiz Shamsi’s first over was the last over of the power play and his second number 14, immediately following on Gayle’s fourth and final over. It meant that Gayle was able to save a couple of his best bowler’s overs for “happy time,” when the batsmen have little choice but to come at him. Over number 14 went for seven and number 16 for 6. Number 18, however, went for 21. Narine’s last over was number 14; it cost four runs and his four cost 21 with 12 dot balls. Fawad Ahmed (4-14-13-3) bowled over number 16, which cost five runs. Ali Khan (4-10-24-1) bowled overs number 15 (6) and 18 (13) and Kevon Cooper’s two overs, numbers nine and 20, cost ten and six respectively. Bravo’s final figures were 4-6-44-2 with 16 coming off over number 19. But don’t expect DJB to pass the responsibility of the death overs to anyone. Expect him instead to lead his team to triumph this evening. To earn victory or die trying. 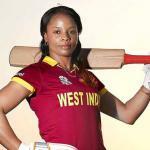 Asked over a week ago to identify the two teams that would be in her dream final, former West Indies wicketkeeper/batsman Merissa Aguilleira never hesitated. Done! Both are now there, the former given the direct route, the latter again taking the road travelled last year. Tut-tutting loudly, the sceptics will say the former were given a bligh. It won’t be easy to persuade them that the script might have nothing at all to do with captain Bravo. As Mr Live Wire might say, Wired868 is unable to confirm which Knight Rider in shining armour has been listening attentively to the lady. It might be TKR owner Shah Rukh Khan. Or it might be manager Colin Borde. Or coach Simon Katich. Could it be all four lady’s gentlemen for whom her wish is a command and who are eager to make her dreams come true? But it certainly is not just the T20 World Cup champion who dreams that dream. And it—and Emrit’s nightmare!—is about to come true as the Red Sea inundates Tarouba in search of calypso cricket played loudly. So should Bravo and his men now duly steamroll the over-achieving Warriors and go on to retain the title they won right here in Tarouba last year, that would be the signal to start the biggest party in South. Headline a bit misleading. Throng brings visions of a huge crowd. Instead television coverage showed vast areas of blue and white – empty seats throughout the stands. Spot on wrt DJ Bravo though.